The Quantek Model 905V is a pharmaceutical headspace oxygen analyzer. Use it for headspace oxygen analysis in pharmaceutical products – vials, blister packs, or bottles. Achieve results with as little as 0.5cc of headspace.Pharmaceutical preparations packaged in vials are often gas-flushed to provide a specific atmosphere in the vial, with defined levels of oxygen, nitrogen or other gases. Depending on the product, these vials can range in size from 1 ml to 250 ml or larger. Small vials present some difficulty for oxygen analysis because the sample volume available is often quite small. A one ml vial, for example, may have only 0.5 ml of headspace gas. 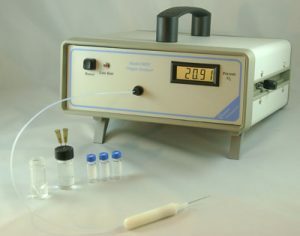 For direct analysis with a pharmaceutical oxygen analyzer, the instrument must be capable of analyzing very small volumes. Our pharmaceutical oxygen analyzer is designed for this process. The Model 905V is a rugged benchtop unit housed in a heavy-duty metal enclosure, well suited for continuous use in routine QC testing in the laboratory. With built-in battery operation (optional) in addition to the AC mode, this unit can be easily transported and used at remote locations such as the packaging line. The Model 905V sensor is designed specifically for this purpose. The oxygen sensor internal chamber has a very small volume of about 0.1 cc. The sensor is located directly behind the front panel to eliminate excessive volume. The sensor has in /out ports with a 0.03 in. ID. 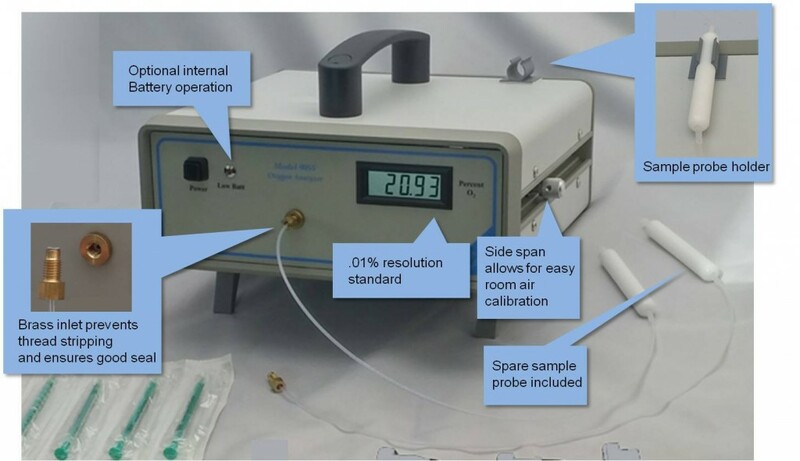 The vent port of the sensor connects to a short piece of narrow-bore tubing for sample exhaust and introduction of zero or calibration gases. The oxygen sensor output is very linear through the entire range of measurement. This allows for a single point calibration to be performed anywhere in the measurement range. Span calibration is accurately done by testing room air, which should give a reading of 20.9% oxygen. Calibration standards can also be used if required by in-house test procedures. Microprocessor based electronics are used for sensor signal processing, battery charging and on/off control to provide high accuracy and reliability. The heavy duty, proprietary oxygen sensor is designed to provide many years of service, is totally sealed and requires no maintenance. The sensor output is compensated for ambient temperature variations. With its low power requirement, the Model 905V can be operated with an optional battery for those applications where AC power is not readily available, or for convenience if spot checking samples at different locations. A totally sealed, long-life internal 12 Vdc gel battery accepts a full or partial charging cycle and will operate the unit for up to 8 hours. The charger module plugs into a standard 110-240V outlet for charging or continuous operation. Alternatively, the unit can be powered from an external 12-24 Vdc source. Origin of Goods: Our products are manufactured in the U.S.A. Optional internal battery. The battery pack is a 10 AA NiMH with high temperature safety shutoff, low voltage cutoff, and 16 hour typical runtime. 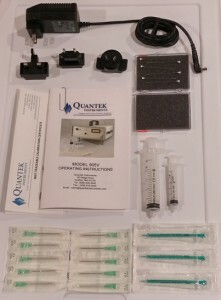 CONTAINER TEST KIT – Add the container test kit for difficult applications where using the pump is not practical. Our patent pending sampling kit can be used to collect samples from almost any imaginable container. Simply puncture the package under water, collect the sample in our inverted funnel, and then sample via the rubber stopper.